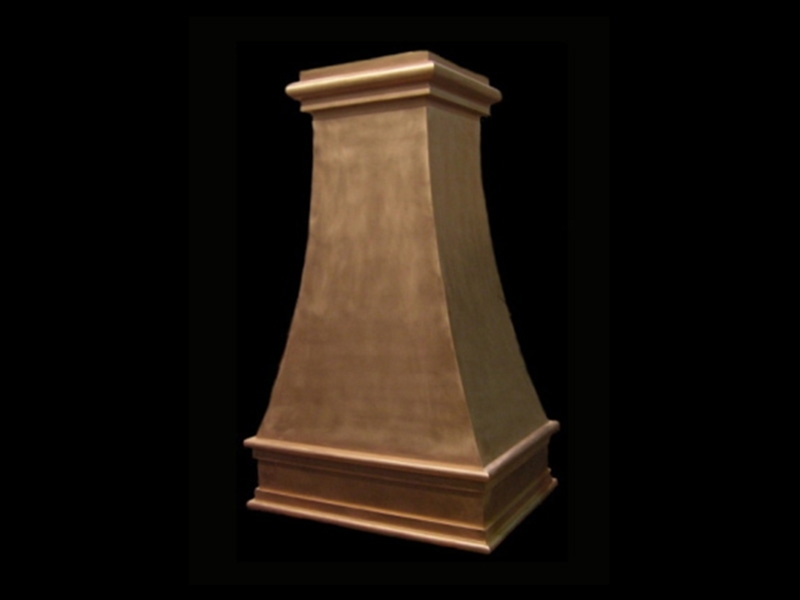 All of our copper range hoods are handcrafted in Indiana, USA, and all are made from 48 oz solid copper. 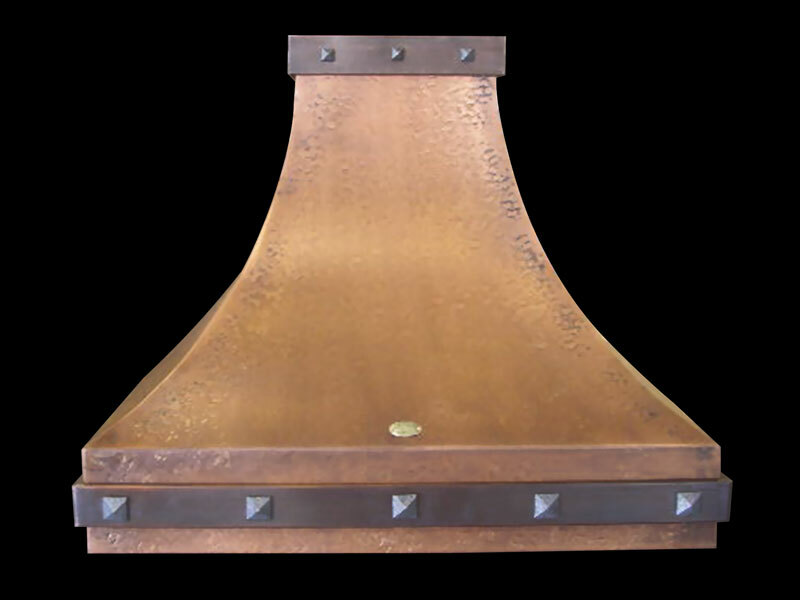 Each copper range hood comes with a choice of copper patina finish, as well as the options of straps, rivets, hand hammering & of course an insert & blower unit. This is a picture of a hood we have displayed in Clark Appliance in Castleton, IN. It is a hammered hood in a Medium Brown patina; it was made out of 48oz. pure American copper. The crown on top was also made by us, out of copper. It is 48” wide, 24” deep and 36” tall. No lead, tin, or arsenic content is contained, like you will find in unregulated foreign copper products. Please contact us to obtain a quote. 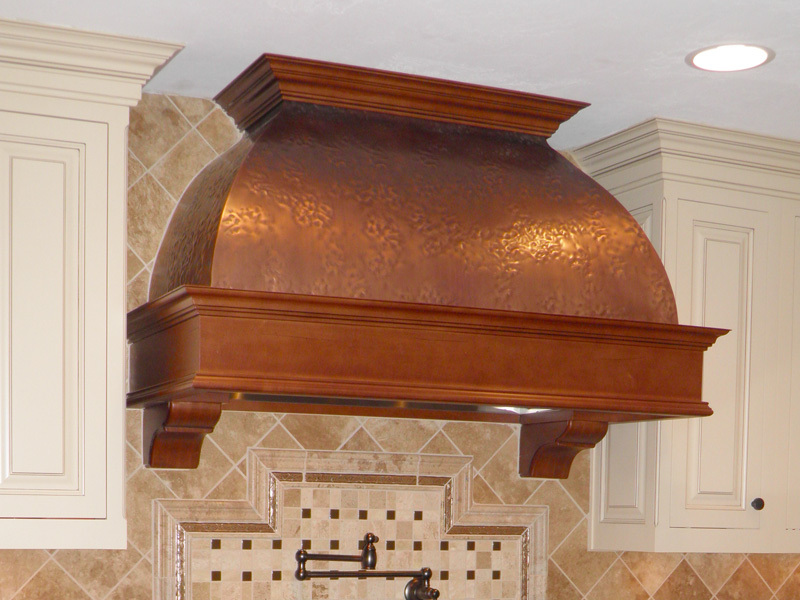 This copper range hood was created at the end of 2009 for a client in northern Indiana. This range is all handmade with 48 oz. pure American made copper. It was made in a hammered finish and with a Medium Brown patina. The top trim was handmade out of 48 oz. copper. This range hood was 42” wide, 20” deep and 40” tall. Please call or email with any custom ideas and we will get a quote together for you. A local Indiana customer wanted a rangehood that would also match the Medieval hammered Signature Farmhouse sink that she ordered from us as well. 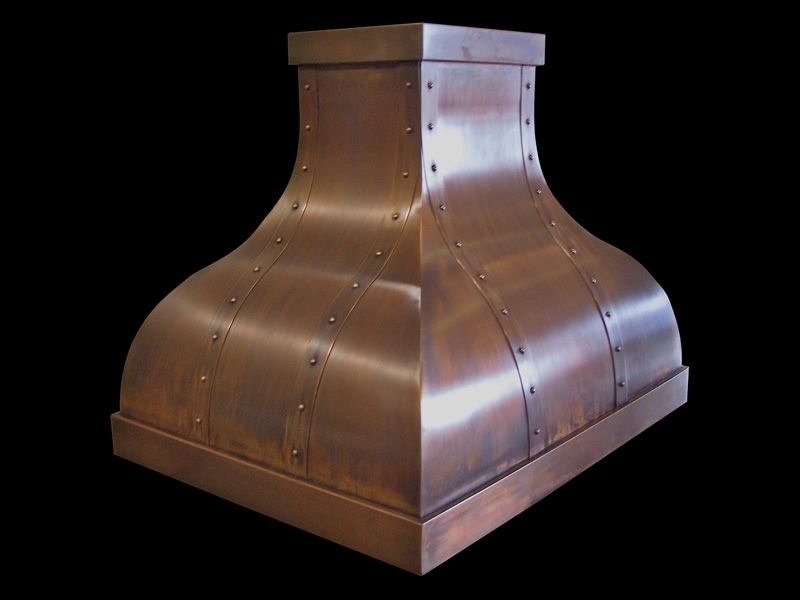 The rangehood was done in the same Medieval hammering and patina. It was made out of 48 oz. and is 42” wide 20” front to back and is 30” tall. Her custom cabinet maker made the bottom to stand out from the rest of the kitchen cabinets. This is a custom piece that required our client, cabinet maker and us to all coordinate together to come up with a design that worked really well. The cabinet maker made the bottom trim to match their cabinets. The body was made with 48oz. copper. The trim was made from 20 oz. copper. It is 42” wide, 22” deep and 40” tall. It is a hammered finish with our Mottled patina applied. 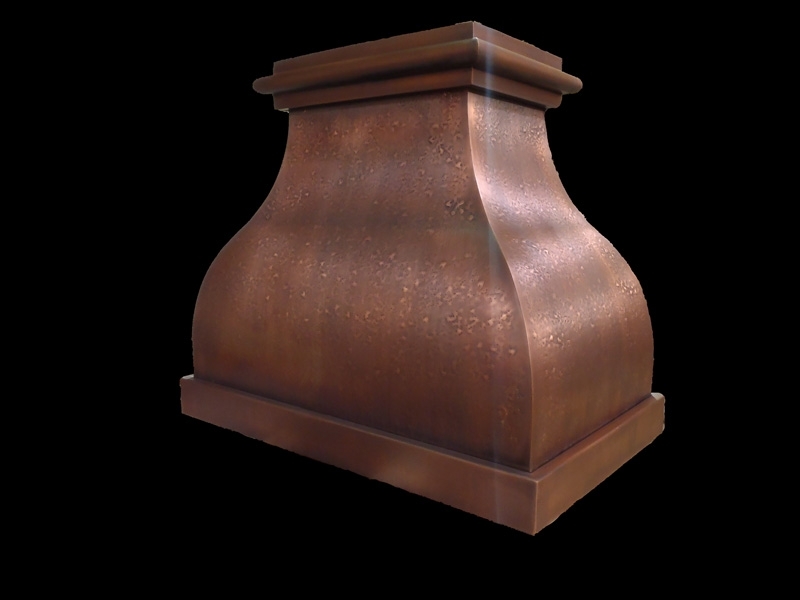 This rangehood is pictured in a regular hammer wih a medium brown patina. The straps and trim are smooth copper with the same patina. This hood is 48" x 22"x 60". The larger trim on top really brought this to the right scale. Please give us a call anytime, we would love to talk about any of our copper products. We fabricated this for a customer that wanted the straps to stand out on their own with the solid copper rivets. We used just a standard square trim on the top and bottom. This is a smooth copper hood with a varied medium brown patina. Please contact us with any questions or to obtain a custom quote. 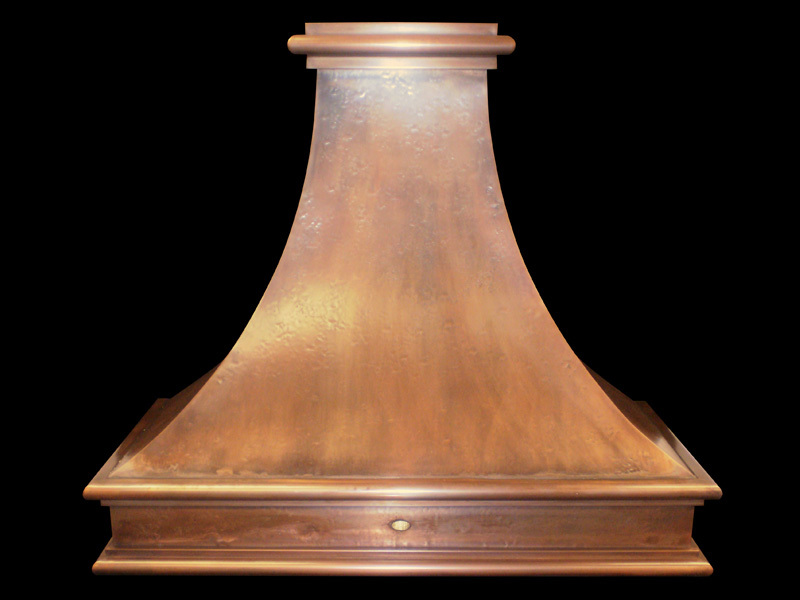 This copper range hood is a very popular model with a traditional look, and fits the style of many homes. The main body is hammered and the whole hood is a varied Medium Brown patina. It is 51” wide, 24” deep and 43” tall. It was made using 48 oz. pure American copper. No lead, tin, or arsenic content is contained, like you will find in unregulated foreign copper products. This is a smaller sized rangehood designed for a 30” cook top. 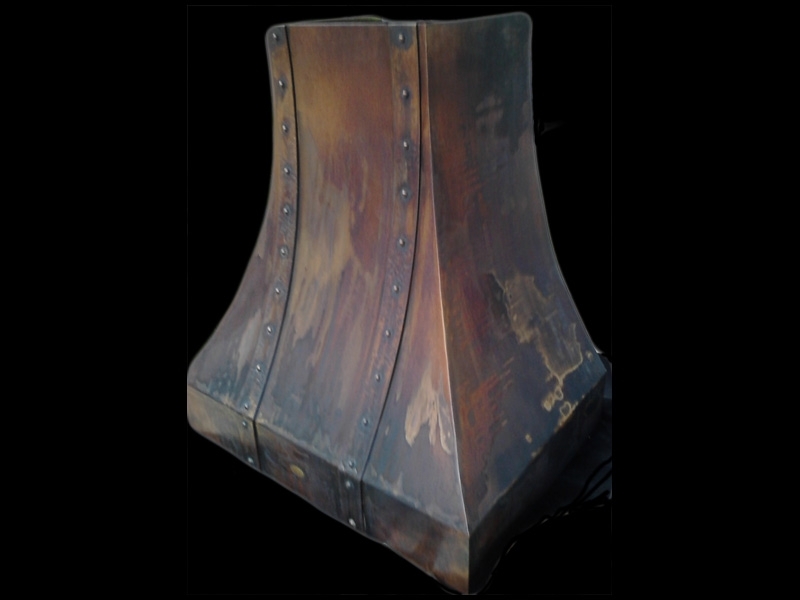 It is 30” wide, 20” deep and 36” tall in a smooth Reddish Brown patina. Our customer wanted a varied patina, so we worked some of the patina off and let it sit overnight before waxing it. It was made out of 48 oz. pure American copper. 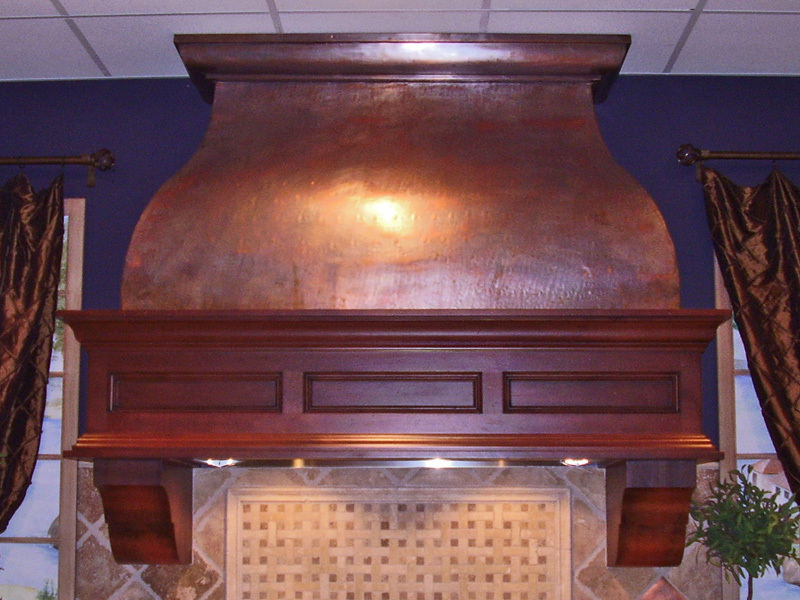 We are a custom shop that can accommodate any size opening you have, to fit a wonderful copper piece in your home. 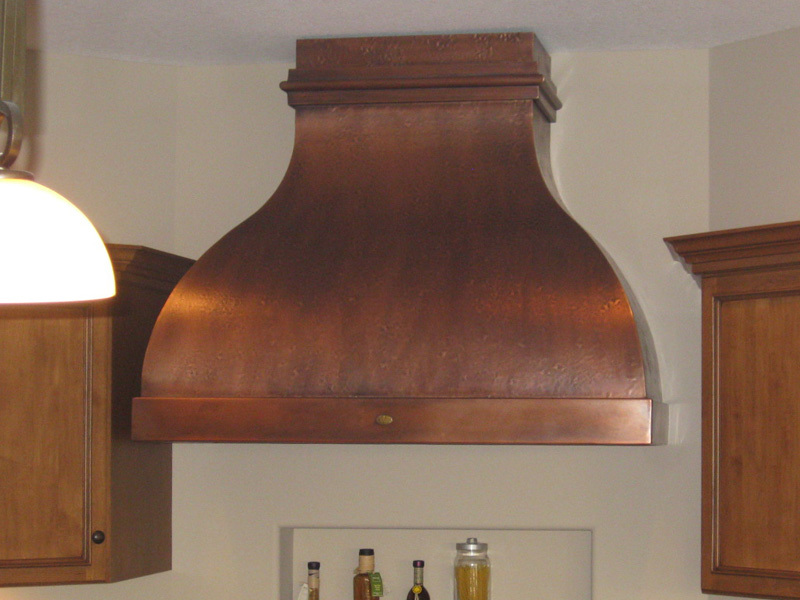 This copper hood was made with a plain trim. Clavos were added to give it a Western look. 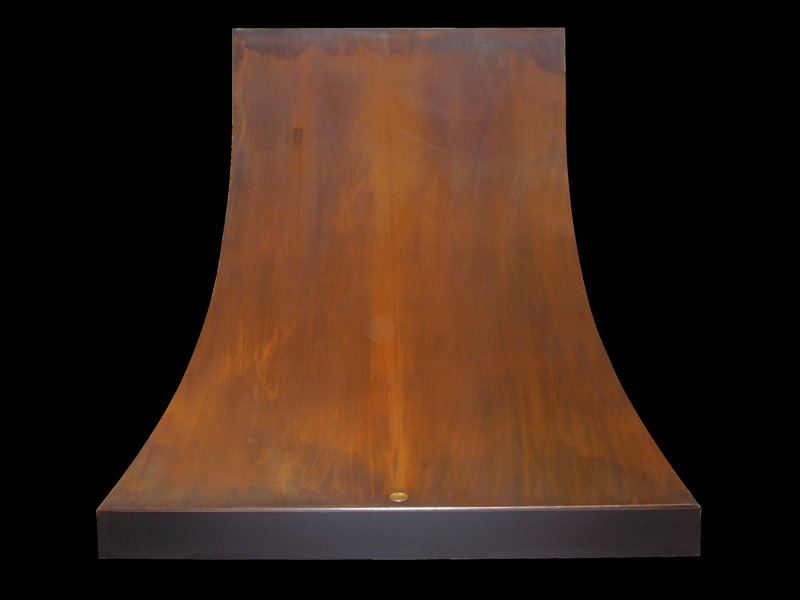 This is a hammered hood with a two-tone patina. The main body is a Medium Brown and the trim is Dark Brown. It is 36” wide, 22” deep and 36” tall. It was made out of 48oz. pure American copper. Please contact us with any questions or to obtain a custom quote. This rangehood is very tall for how wide it is at the bottom. It is 40" x 22" x 72" tall. It is a smooth copper hood in a light brown patina. 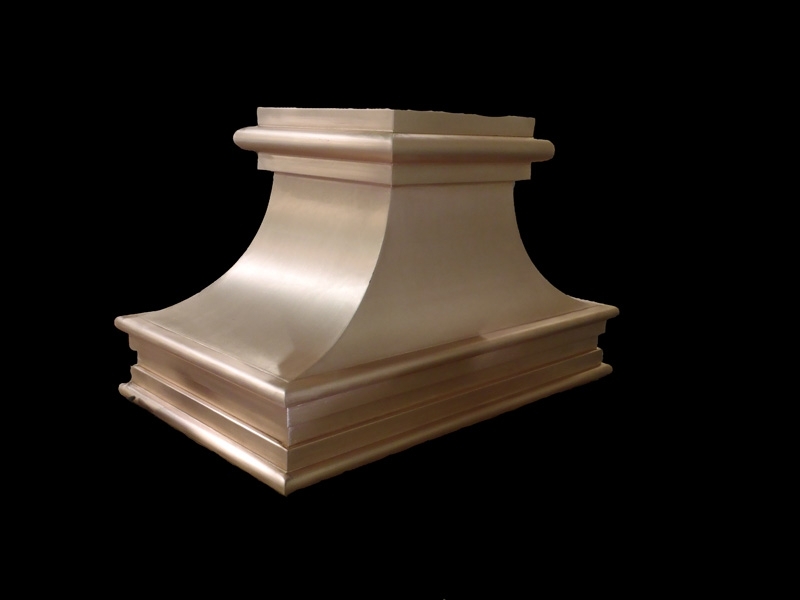 The two different types of trim on this hood can be used on any hood or in any variation. We can draw up anything you can dream up and be able to show you a rendering of it. Just give us a call, email or fax to get started. This is another large rangehood, it is 60" x 24" x 42" tall. 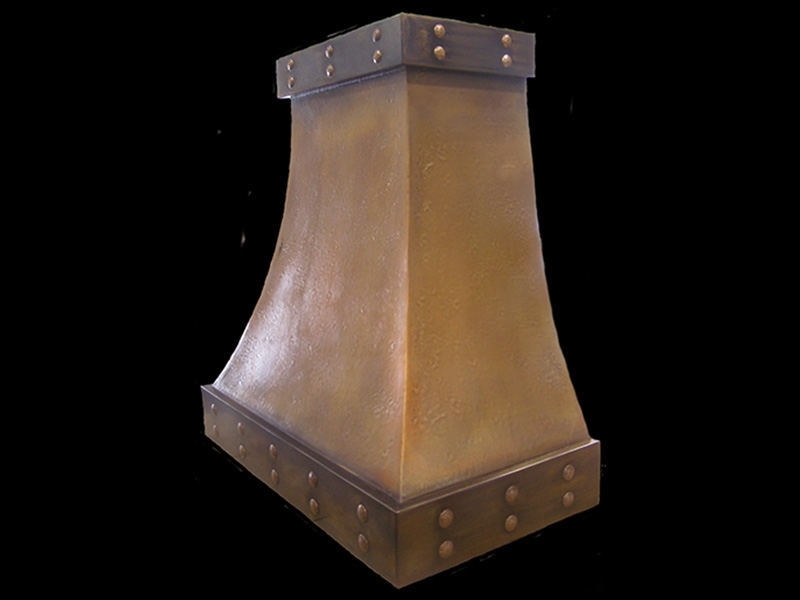 It has our regular hammer body in a medium patina and the smooth trim is a dark patina with copper clavos. We have different types of clavos and rivets that we can use to change our designs around or match other hardware in your kitchen. This hood has a custom artistic patina applied. It is a smooth hood that is 30" wide and 30" tall. 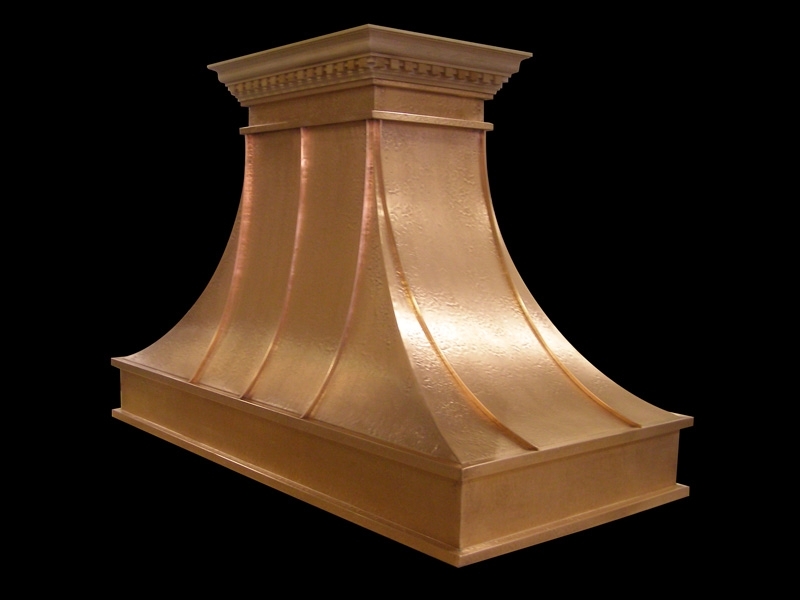 We designed this hood for a local Indiana customer with a short ceiling height of 8'. 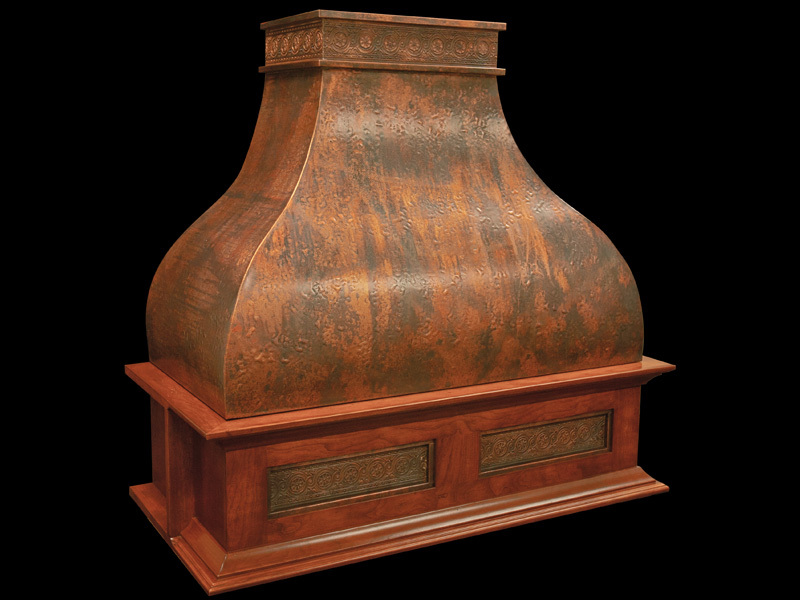 This hood is 42" x 22" x 24" tall in a Island style. It is a bare copper with just a wax coat to keep it shiny. The customer liked the new look of copper instead of letting the copper get its own patina. Please call or email with any custom ideas and we will get a quote together for you. This is another large bare finish hood with our regular hammer. This hood is 60" x 30"x 50" tall. This is a solid rangehood that ended up being a very heavy piece. We had to add extra bracing on the inside of it. The customer was using cherry wood cabinets and trim in the kitchen and wanted a nice cherry dentel crown to accent their hood. We can do this on most hoods and using any kind of wood species. We can even use your cabinet trim if it is sent to us.